Goodbye Gigantic Pile Of Dishes! Finally A Master Pan In Which All Meals Can Be Made At Once! If you don’t cook food just because you find cleaning the utensils a pain in the neck, then worry no more. 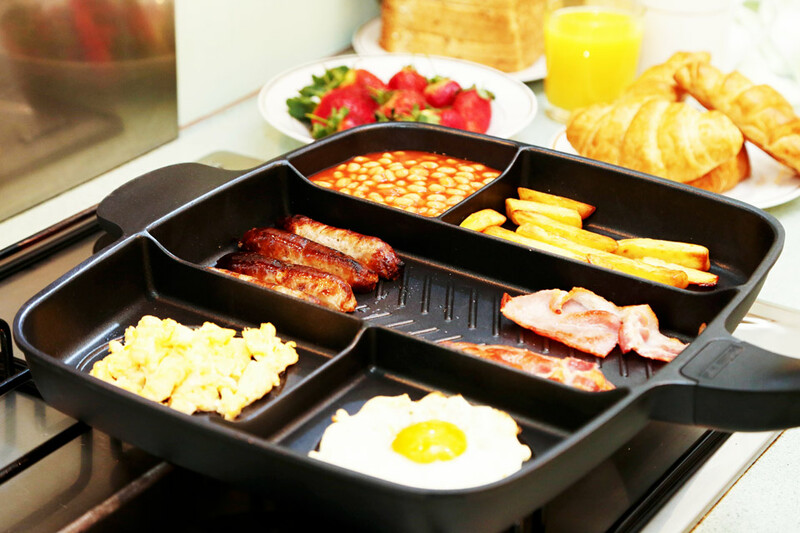 The Master Pan cooks your breakfast and all other meals all at once, which means only one pan for you to clean! The Master Pan is nonstick, made of aluminium and one can even cook meat in it. Because of the aluminium every part of the pan is heated evenly, leading to perfect cooking. The Master Pan requires scrubbing like any other regular pan and claims to use less water under one burner. Created by Chris Matasakis and Raj Nagrani after a painstaking two-year production and redesigning process, the idea behind Master Pan is to cook a complete meal in lesser time and is now used by many chefs worldwide. The pan is a little on the heavier side though, because of its 100% aluminium body, weighing at 3.75 pounds. Master Pan is not compatible with induction stove tops but works fine with gas and electric stoves. It also has a two year manufacturer warranty. Though the pan is relatively large in size, it will be of no trouble once you get used to it. Buy it here from Amazon.